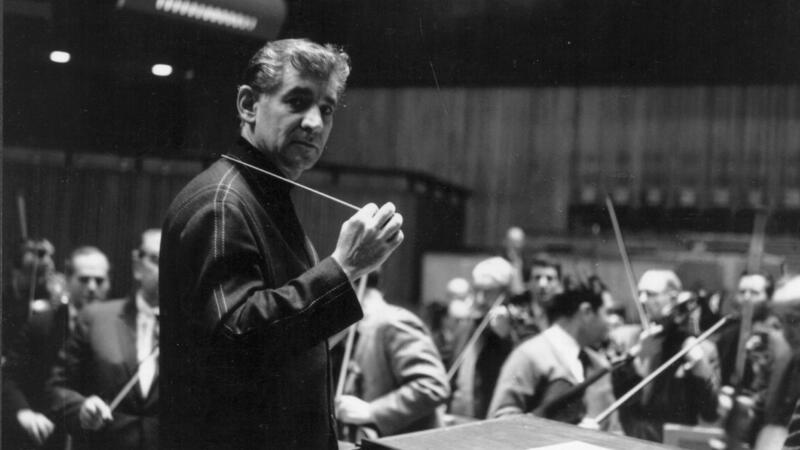 Leonard Bernstein conducting at London's Royal Festival Hall in 1963. "Sometimes when you watch Bernstein conduct ... it's his own involvement and enthusiasm at that moment, his own kind of oneness with the work," archivist Barbara Haws says. Paul de Hueck / Courtesy of The Leonard Bernstein Office, Inc.
Aug. 25, 2018 marks the centennial of Leonard Bernstein's birth. He was a singular American talent and one of the great orchestra conductors of his generation. He was also a composer of symphonies, ballets and hit musicals, a teacher, a television personality and a complicated man with a complicated personal life. If there was one moment when Leonard Bernstein became Leonard Bernstein, at least to the general public, it was at a concert by the New York Philharmonic on Nov. 14, 1943 at Carnegie Hall in Manhattan. The conductor, Bruno Walter, called in sick. The 25-year-old Bernstein stepped in with only a few hours' notice and without a single rehearsal. "When my father climbed up on that podium in Carnegie Hall and conducted the New York Philharmonic on a national radio broadcast that Sunday afternoon, that was why it was front page news the next day. Like, 'Local boy makes good,'" says Jamie Bernstein, the late conductor's daughter. In just the following year alone, Bernstein premiered his first symphony, Jeremiah, his first ballet, Fancy Free and his first Broadway musical, On the Town. Bernstein grew up outside of Boston, born to Russian immigrant parents. His father, Sam, had every expectation that his son would follow him into the hair and beauty products business, to the point that he wouldn't pay for young Leonard's piano lessons. Nevertheless, Bernstein studied at Harvard and the Curtis Institute of Music, and spent summers at Tanglewood, the Boston Symphony Orchestra's seasonal home in the Berkshires. It was there that Bernstein came under the influence of conductor Serge Koussevitzky and composer Aaron Copland. The two of them had grand plans for their protégé, says Nigel Simeone, who edited a volume of Bernstein's letters.
" 'I don't know whether they think of me as a conductor or a composer, you know. Maybe they want me to be a conductor so that I can play their music and they don't want me to be a composer so that I'm not kind of competition for them,' " Simeone says, reading from one of Bernstein's letters. "I don't think Copland saw it that way, at all. But I think he did see in Bernstein somebody who could be, you know, a really stunning advocate of his music and of other people's music." Whether to be a conductor or a composer was one of the big conflicts of Bernstein's life. Yet he was good at expressing those feelings in the music to his orchestras, according to New York Philharmonic archivist Barbara Haws. "Sometimes when you watch Bernstein conduct, and he's so involved and he's so into it — you know, it's his own expression," Haws says. "It's not even trying to communicate something specific to the orchestra. It's his own involvement and enthusiasm at that moment, his own kind of oneness with the work." And communicating that enthusiasm to audiences led to, perhaps, one of Leonard Bernstein's greatest contributions. His nationally televised Young People's Concerts not only helped introduce classical music to children, but also popularized it with their parents. Some of those TV scripts were worked out at home with his kids, Jamie Bernstein says. But she notes that her father had to turn off that public persona to compose. "A composer is solitary and contemplative and turned inward," she says. "They have to work all by themselves, which was not a thing my father liked to do. He hated being all alone." This may explain why, for many, some of Bernstein's greatest compositions were for either the ballet or the theater, where he was able to collaborate in the same room with artists such as choreographer Jerome Robbins or lyricist Stephen Sondheim, as they did for West Side Story in 1957. Jazz pianist Bill Charlap says Bernstein's music for the theater was as serious as his music for the concert hall. "It's real through-composed music, all the way from the bottom to the top," he says. Bernstein's personal life was complex as well. As a young man, he had many gay affairs, but he married Felicia Montealegre, a Chilean-born actress, and raised a family. And while their family life was loving, Jamie Bernstein has revealed some less savory aspects of her father's behavior in her recently published memoir, Famous Father Girl: A Memoir of Growing Up Bernstein. She recalls unwanted kissing of men and women, and of herself. "He prided himself on being governed by his whims, in a way in a way that's just not really adult," says Anne Midgette, the Washington Post music critic who has written about the #MeToo movement in classical music and about Bernstein. "For a long time, our society has embraced this view of artists as people who were to be indulged. Bernstein kind of epitomizes that. And I feel like we, as a society, are moving past that." Still, Midgette sees Bernstein as a crucial figure in classical music, as does Barbara Haws. "We're still trying to find the next Leonard Bernstein," Haws says. "He set that bar so high that it's very difficult for symphony orchestras to kind of recover and move on, because you only have one of those, probably, once in a century, if you're lucky." 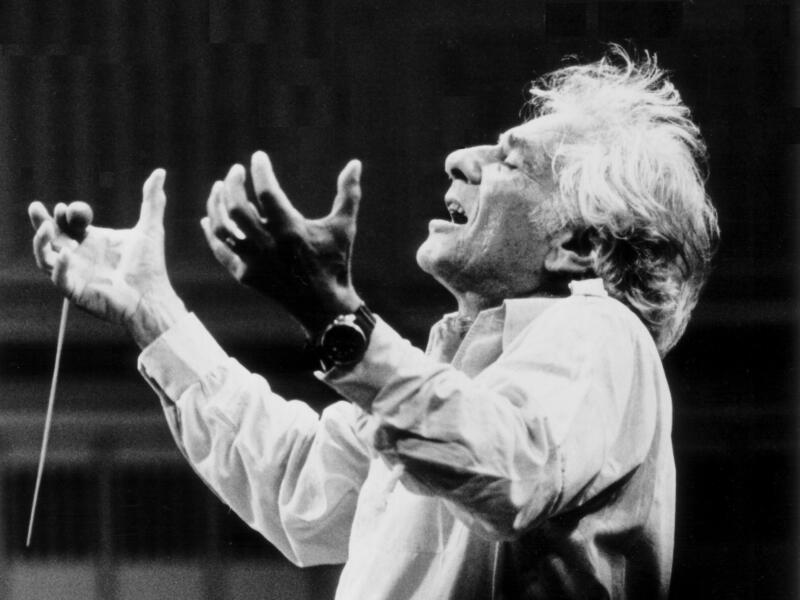 Tomorrow marks the 100-year anniversary of Leonard Bernstein's birth. Bernstein was an extraordinary American talent. He was one of the greatest orchestra conductors of his generation. He also composed symphonies, ballets and hit musicals like "West Side Story." He was a teacher, a television personality and a complicated man with a complicated personal life. Jeff Lunden has this appreciation. JEFF LUNDEN, BYLINE: If there was one moment when Leonard Bernstein became Leonard Bernstein, at least to the general public, it was on November 14, 1943. LUNDEN: The concert's conductor, Bruno Walter, called in sick. UNIDENTIFIED PERSON: ...And his place will be taken by the young, American-born assistant conductor of the Philharmonic Symphony, Leonard Bernstein. LUNDEN: Leonard Bernstein was just 25 years old. Jamie Bernstein is his first-born daughter. JAMIE BERNSTEIN: When my father climbed up on that podium in Carnegie Hall and conducted the New York Philharmonic on a national radio broadcast that Sunday afternoon, that was front-page news the next day - like, local boy makes good. LUNDEN: ...And his first Broadway musical, "On The Town." UNIDENTIFIED ACTORS: (As characters, singing) New York, New York - it's a hell of a town. LUNDEN: Leonard Bernstein grew up outside of Boston to Russian immigrant parents. His father, Sam, had every expectation that his son would follow him into the hair and beauty products business, to the point that he wouldn't pay for young Leonard's piano lessons. Nevertheless, Bernstein studied at Harvard and the Curtis Institute of Music and spent summers at Tanglewood, the Boston Symphony's seasonal home in the Berkshires. LUNDEN: It was there that Bernstein came under the influence of conductor Serge Koussevitzky and composer Aaron Copland. The two of them had grand plans for their protege, says Nigel Simeone, who edited a volume of Bernstein's letters and reads from one. NIGEL SIMEONE: (Reading) I don't know whether they think of me as a conductor or a composer. You know, maybe they want me to be a conductor so that I can play their music and they don't want me to be a composer so that I'm not kind of competition for them. I don't think Copland saw it that way at all. But I think he did see in Bernstein somebody who could be a really stunning advocate of his music and of other people's music. LUNDEN: Whether to be a conductor or a composer was one of the big conflicts of many that marked Bernstein's life. Yet he was really good at expressing the feelings in the music to his orchestras, says the New York Philharmonic's archivist, Barbara Haws. BARBARA HAWS: Sometimes when you watch Bernstein conduct, he's so involved and he's so into it. It's his own expression, right? It's not even trying to communicate something specific to the orchestra. It's his own involvement and enthusiasm at that moment, his own kind of oneness with the work. LUNDEN: Communicating that enthusiasm to audiences led to perhaps one of Leonard Bernstein's greatest contributions. His nationally televised "Young People's Concerts" helped introduce classical music not just to children but also popularized it for their parents. LEONARD BERNSTEIN: Now, we can really understand what the meaning of music is. It's the way it makes you feel when you hear it. Finally, we've taken that last, giant step and we're there. We know what music means now. And we don't have to know a lot of stuff about sharps and flats and chords and all that business in order to understand music if it tells us something. LUNDEN: Some of those scripts were worked out at home with his kids, says daughter Jamie Bernstein. But she says her father had to turn off that public persona to compose. BERNSTEIN: The composer is solitary and contemplative and they have to work all by themselves, which was not a thing my father liked to do. He hated being all alone. LUNDEN: Which may explain why, for many, some of Bernstein's greatest compositions were for either the ballet or the theater, where he was able to collaborate in the same room with artists such as choreographer Jerome Robbins or lyricist Stephen Sondheim, as they did in "West Side Story" in 1957. LUNDEN: Jazz pianist Bill Charlap says Bernstein's music for the theater was as serious as his music for the concert hall. BILL CHARLAP: If you think about the melody of "Cool," it goes - (playing piano). And it's not just this with the chords - (playing piano). It's more than that. He's written a counter melody that goes like this - (playing piano). That's real composition. LUNDEN: Bernstein's personal life was complex as well. As a young man, he had many gay affairs, but he married Felicia Montealegre, a Chilean-born actress, and raised a family. Jamie Bernstein describes one letter her mother wrote to her father. BERNSTEIN: She says flat out, you're a homosexual and I know this, but there's no reason why we can't give this marriage a try. We really do love each other, and let's just try it. LUNDEN: And while their family life was loving, Jamie Bernstein has revealed some less savory aspects of her father's behavior in a recently published memoir - unwanted kissing of men and women and of Jamie herself. Washington Post music critic Anne Midgette has written about the #MeToo movement in classical music and about Bernstein. ANNE MIDGETTE: He prided himself on being governed by his whims in a way that's just not really adult. And for a long time, our society has embraced this view of artists as people who were to be indulged. And I feel like we as a society are moving past that. LUNDEN: Still, she sees Bernstein as a crucial figure in classical music, as does New York Philharmonic archivist Barbara Haws. HAWS: You know, we're still trying to find the next Leonard Bernstein. He set that bar so high. It is very difficult for symphony orchestras to be able to kind of recover and move on because you only have one of those probably once in a century if you're lucky. (SOUNDBITE OF LEONDARD BERNSTEIN'S "CANDIDE OVERTURE") Transcript provided by NPR, Copyright NPR.